The line at the Dunkin’ Donuts cafe in Midtown Manhattan stretched to the door on this June weekday morning. Iced coffee, cappuccino, latte — name the java drink, and customers were sipping it down. Donuts and muffins were also going fast. Dunkin’ Donuts shops have become popular stomping grounds for Americans craving a cup of joe and the snacks to go with it. It’s the top quick-service restaurant chain in America for hot coffee, iced coffee, donuts and bagels and muffins, says Paul Carbone, chief financial officer at the chain’s parent Dunkin’ Brands (DNKN). Carbone expects that popularity to continue as Dunkin’ Donuts steps up expansion east of the Mississippi River while moving westward beyond its home base in the Northeast. “We believe we have the capability of growing in all parts of the country, and by having Dunkin’ Donuts coffee available in grocery stores nationwide we are raising awareness of the brand there before we open stores in that market,” Carbone said. Dunkin’ Brands, which went public last July 27, also owns the Baskin-Robbins ice cream chain. The bulk, or roughly 75%, of annual revenue, comes from Dunkin’ Donuts, which has more than 10,000 stores worldwide, approximately 7,000 of which are in America. Some 60% of Dunkin Donuts’ U.S. franchisee sales come from coffee. Dunkin’ Brands is roughly a 100% franchised business model, which essentially eliminates store operating expenses, resulting in higher margins than its peers, says Stephens analyst Will Slabaugh. The company’s game plan involves boosting Dunkin’ Donuts’ presence outside its core markets of New England and New York, where it has one store for roughly every 10,000 people. The firm’s focus on upping it presence east of the Mississippi could lead to a boost of its one Dunkin’ Donuts store for every 100,000 people. It also sees a big growth opportunity in the West, where it has only 130 stores and just one store per 1.2 million people. Dunkin’ Brands aims to more than double the total number of U.S. Dunkin’ Donuts stores to 15,000 over the next 20 years. The company sees the potential to have 5,000 Dunkin’ Donuts stores in the West, says Carbone. That move is in a “contiguous fashion,” he said. It has stores in Dallas, Phoenix and Las Vegas, which, says Carbone, serve as the hubs for its Western development. It also recently started recruiting franchisees for markets such as Denver and Colorado Springs. As Dunkin’ Donuts expands westward, it will be competing head to head with the likes of Seattle-based coffee giant Starbucks (SBUX), which has a large West Coast operation. But watchers expect Dunkin’ Donuts’ business to stay piping hot as it expands throughout the U.S.
Its low coffee prices, at roughly $1.75 for a regular-size hot coffee in Manhattan, are a big draw, say followers. “Their value price points and differentiated doughnut offering should provide them with a good opportunity to add stores and be competitive with more expensive brands like Starbucks,” said Darren Tristano, executive vice president at industry consultant Technomic. Dunkin’ Donuts continues to be innovative with items such as breakfast sandwiches, he adds. “That, combined with the affordability of its products, has given the company a very good positioning in a somewhat difficult economic climate,” he said. Dunkin’ Donuts is a well-known brand, he says, and as it enters a new market, consumers are already familiar with the bagged coffee it sells at grocers. That elevated brand awareness helps push revenue in the new stores to high levels. So far, so good. Carbone says Dunkin’ Donuts has been successful in leveraging the brand’s strength and existing franchisee base as it’s expanded in new markets such as Pittsburgh and Charlotte, N.C.
“There is a strong national brand awareness and consumer demand for Dunkin’ Donuts,” he added. That demand showed up in the latest results from Dunkin’ Brands. Dunkin’ Donuts’ first-quarter U.S. same-store sales rose 7.2% vs. a year earlier as the chain enjoyed nice gains in everything from cold drinks to its steak, egg and cheese breakfast sandwich. It got a nice jolt from sales of the K-Cup portion packs used with the Keurig single-cup coffee brewing system made by Green Mountain Coffee Roasters (GMCR). Dunkin’ Donuts restaurants began offering 14-count boxes of Dunkin’ Donuts coffee in K-Cup portion packs in August. Carbone says K-Cups are driving significant incremental franchisee profit and helping to further expand the brand. “We were pleased with the first-quarter performance of K-Cups, which represented approximately 30% of our comp-store sales growth during the quarter,” he said. Jefferies & Co. analyst Andy Barish says K-Cups and Dunkin’ Donuts’ increasing focus on breakfast sandwiches have been the key drivers of same-store sales and should continue to do so. Barish feels “comfortable” with a long-term target of 2% to 4% annual same-store sales growth for Dunkin’ Donuts. Breakfast sandwiches are a big hit. Internal research shows consumers like Dunkin’ Donuts because they can get breakfast sandwiches anytime of day, says Carbone. That helps differentiate the chain from other brands in the market, he adds. Dunkin’ Brands has been enjoying a nice run since its market debut. In the most recent first quarter, earnings rose 213% to 25 cents a share. Dunkin Brands’ revenue grew 9% to $152.4 million. Baskin-Robbins’ same-store sales rose 9.4% vs. a year earlier. The chain benefited from new product news around its Valentine’s Day cake bites and its new “More Flavors, More Fun” ad campaign. Analysts polled by Thomson Reuters expect full-year earnings to rise 33% to $1.25 a share. They see a 16% gain in 2013. Tristano places Dunkin’ Donuts in the coffee cafe segment, which includes chains such as Starbucks. He estimates the segment’s sales will rise 5% to 6% in 2012 vs. a 5% gain in 2011. 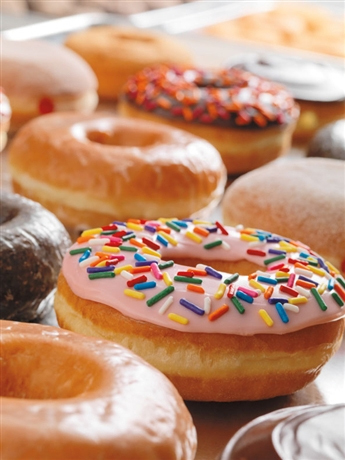 Dunkin’ Brands expects Dunkin’ Donuts’ U.S. same-store sales to grow 4% to 5% in 2012 and Baskin-Robbins to see a 2% to 4% gain. It plans to add 260 to 280 Dunkin’ Donuts restaurants this year. It also expects to open 350 to 450 units overseas for Baskin-Robbins and Dunkin’ Donuts combined this year . Carbone says international expansion is an important focus. It recently opened the first Dunkin’ Donuts restaurants in India and Guatemala. This entry was posted on Friday, September 7th, 2012 at 8:15 am and is filed under Beverage, Donut, Expansion Strategy, Franchise Activity, Future Plans/Announcements, Growth, Menu Development/Innovation, Price, Quick Service. You can follow any responses to this entry through the RSS 2.0 feed. You can leave a response, or trackback from your own site.